A standoff is a piece of hardware that is used to mount you substrate or material away from the wall. It usually includes a cap, stud, washers, and a barrel. What tools are required for install? To install most of our products you would need a drill, drill bit, and screw driver. It would be recommended that a level is utilized to ensure proper and level mounting. All shipped orders receive a confirmation email with your tracking number. We can also assist with tracking the order by phone at 813-938-6025 and with your order number our online sales representative will also be able to assist you in tracking the order. Please feel free to also email any questions that you may have to sales@mbs-standoffs.com. Please email all return information to our Return Specialist at salesrep1@mbs-standoffs.com. The information needed in the email for the return is your name, company name, order number, best email to contact you at, best phone number to reach you at, reason for the return. Once the return specialist get the information she will process the return in a timely manner. Will MBS Standoffs share, sell, or rent my address to anyone? MBS Standoffs is committed to protecting your personal information and privacy. No information will be sold or shared with any third party outside of the duties required to fulfill the order. MBS Standoffs has passed all required processes to be compliant with information security. Can orders be shipped out of the United States? Yes, we can ship orders internationally. 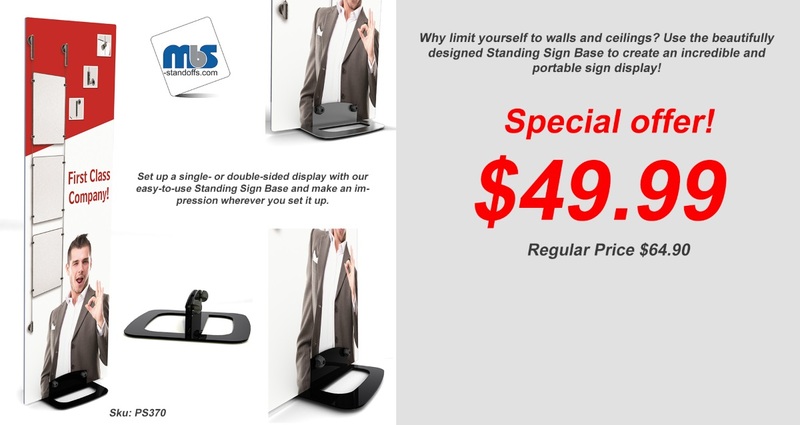 International orders must be placed by phone at 813-938-6025 or by email at sales@mbs-standoffs.com. When placing an international order please provide us with all your company and order information so that we may quote you properly. All orders will be shipped via DHL. We do accept third party carriers as long as you provide the shipping details. All international orders must be paid via wire transfer. When placing your order all the information will be provided when the quote is sent via email. What hardware will I need to purchase in order to use the art hanging systems? The hardware needed to use the art hanging systems includes the rail, the hanging cables, cable hooks, and the mounting hardware for the rails. What is the difference between the classic rail and the ceiling rail? The classic rail is designed to be mounted to the wall and the ceiling rail is designed to be mounted to the ceiling at the corner where the wall meets. What length do the rails and tracks come in? All of our rails and tracks come in 72” or 6ft length. Sales tax will not be charged unless you are located in the state of Florida or the state of Nevada. If you have a resale certificate for either state please email it to sales@mbs-standoffs.com or give us a call at 813-938-6025 and we will make sure to mark your account accordingly. When my order is placed online is my credit card information secure? Online credit card purchases are processed through Authorize.net. Authorize.net is one of the best and most secure providers for processing credit card charges through the internet. They are a third party vendor and we do not have access to the card information from this vendor. We do recommend that you clear your cookies and make sure that you have a secure internet connection when placing your order. This is because we cannot control what happens between your system and ours when the order is processed. When orders are placed with MBS Standoffs we offer shipping through FedEx, UPS, USPS, and DHL. All shipping charges are received from them and we do not control what they charge. If you would like to utilize your own shipping account there will be a $5 charge, then you would pay the fee charged to you by the shipping company provided. How long does install usually take? The amount of time required to install your project determines on how handy the installer is and how extensive the project is. It can take anywhere from 10 minutes and above to install. All installations are pretty simple and straightforward. It usually just involves marking your mounting surface, drilling the holes for the mounting hardware and mounting the signage and/or art. If there is additional information or instructions a Sales Representative can assist you by phone at 813-938-6025 or by email at sales@mbs-standoffs.com. We also have installation videos and guides available on our website. Can you use the cable and rod systems outside? The cable and rod systems are best used indoors. We do not recommend that they be used outside. How much weight can a standoff hold? Each standoff is rated for 18lbs per and that is not including how it is being mounted. If the product is mounted properly there will be a greater supported weight. Please refer to the data sheets provided with the anchors for drywall and concrete. How much weight can be supported by the stainless steel cable? The 1/16” stainless steel cable can support up to 50 lbs. not including the mounting hardware. The 1/8” cable can support up to 100 lbs. per cable not including the mounting hardware. Please contact the office at 813-938-6025 or you can also reach us via email at sales@mbs-standoffs.com within 30 min of processing the order to cancel or change orders. What other terms are used for Clear Anodized Aluminum? The other terms used for Clear Anodized Aluminum are Dull Aluminum, Brushed Aluminum, and Satin Aluminum. A cap is the piece that finishes the overall look of the application. It is the part that holds the material to the barrel. It is also known as the puck or head. We currently only have 2 warehouse locations. The main office is located in Tampa, FL. Our second location is located in Henderson, NV. We do have “store pickup” available as long as you are located near either location. A barrel is the base of the standoff that is what holds the material away from the wall. The bolt that holds the cap and barrel together through hole in your substrate or material. Where should I drill my hole on my substrate? This is completely up to you and the customer but it is recommended that usually the hole sits 1” – 2” away from the edge of the material. How many standoffs are suggested for my sign? The amount of standoff usually is based on the size of the sign itself. We normally recommend a standoff every 2’ or 24”. A good example would be a 4’ x 8’ sign the recommended amount if standoffs would be 4 across the top and 4 across the bottom so a total of 8 standoffs. Can you cut the rods, rails, tracks, and z-clips? Yes, it is recommended that you contact your local hardware store for the correct tools to cut the aluminum and stainless steel with. Does the flag sign come without the glass? The flag sign is sold as a set and cannot be sold separately. Do you offer special packaging? We do offer terms to customers but they have to be part of our Pro program and have at least 10k in sales with us. What is MBS Standoffs return policy? If there are any problems with the order they must be reported to MBS within 48 hours of the product being received. On all returns the original price paid for shipping is non-refundable. This includes ground, expedited shipping, and freight. On all returns the customer will have to pay for return shipping. An exception will be made if the fault falls on MBS. Before any returns will be accepted by our shipping department there must be a RMA number present on the box. This would be sent to you by email from the return specialist. All returns with MBS are subject to a 20%- 50% restocking fee. We understand mistakes can be made and there is fault on MBS the restocking fee will be waived. If the items do not come back in original packaging or come back damaged due to negligence from improper packaging then MBS has the right to deny payment back on the return or process the return with a 50% restocking fee depending on the situation. We accept all major credit cards; Visa, MasterCard, Discover, and American Express. We also accept checks, e-checks, PayPal, wire transfers, and COD. Payments made by wire transfer and COD are subject to an additional fee. What is the weight limit for the Z-Clips? The weight limit is based on the anchoring system used. Please refer to the data sheets available on our screws and anchors. All orders are shipped same day as long as we have the product in stock. The latest that an order can be placed is 7:30 pm ET. What is a normal lead time for back orders and custom products? Usually we have a 10-14 day lead time depending on the product. The lead time usually starts after the purchase has been made. Why is the customizable line so much more expensive than the inexpensive line? The customizable is line is “Al a Carte” which means each piece is sold separately. The inexpensive line is sold “all in one” so it includes everything but the mounting hardware. Is there a performance difference between the stainless steel and aluminum? The only difference between aluminum and stainless steel is the finish. What grade of stainless steel do you use in your product? Our stainless steel products is made form 3 different grades of stainless steel. Grade 201 is for indoor use only, Grade 304 is for indoor and outdoor use, and we also have 316 Marine Grade stainless steel. Can I paint the standoffs? Mbs Standoffs does not recommend painting the standoffs since they are already processed for their finish at our production facility. We have had customer who have painted out products with a third party but there will be no returns accepted if it doesn’t work.